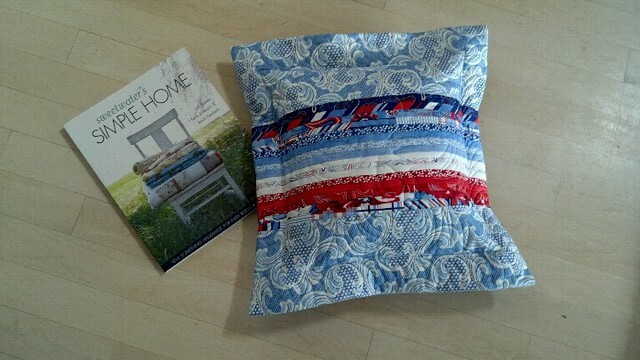 Thanks to Susan, I had the chance to sit down and sew with Sweetwater's new Simple Home book published by Stash Books. Authors Lisa Burnett, Karla Eisenach & Susan Kendrick have collected 35 projects to add a handmade touch to every room in a home. 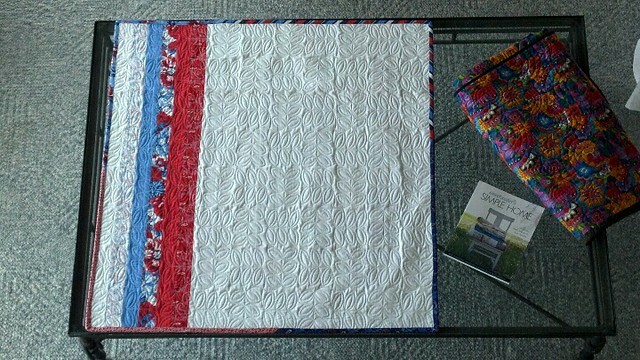 I thought that the "Guest Throw" quilt looked simple and charming (not to mention fast and easy!). I had a jelly roll on hand that I wanted to use, so I picked out 16 strips and got started. This is a very fast and fun project with very clear instructions. My only caution to you, dear reader, is to be as accurate as possible when sewing the strip sets. Be sure to measure your strip sets when you get to Step 5; you may have to adjust the final length. I used the remaining strips from the jelly roll to piece the backing and as a scrappy binding. Quilted up and finished, I think it looks great! which, darling as it is, I'm going to give it away at the next PMQG meeting (mark your calendar for Thursday, 3/15, 7pm). If you like simple projects with a modern approach, a few (or a lot) of projects in this book will appeal to you. In the quilted category, there are table runners, wallhangings, throw quilts as well as larger quilts. 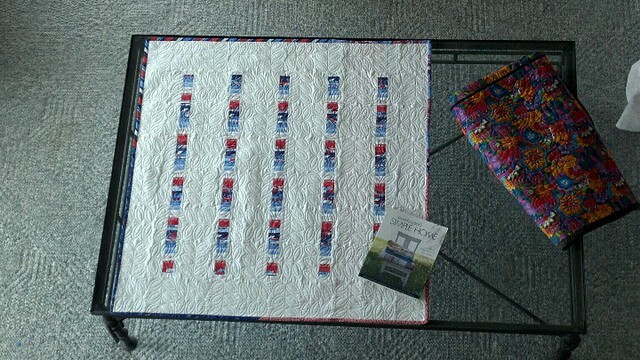 A number of projects could also be quilted--like the pillows, totes, floor cushion, jar labels, chair and notepad covers . . .
All of these projects are "beginner-friendly", which is nice for beginners but also nice for those among us who are looking for a fast project (need a quick gift?). Looking through the book, it was impossible for me to pick a single favorite, and there's a few that are now on my project list. Enjoy! Newer PostMarch Meeting Reminder & Two Quilting Events!